If you are thinking about a new custom leather jacket, look at Jackie Robbins’ work, she has been making custom leather jackets for almost 40 years. 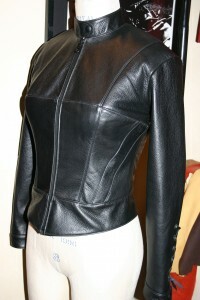 Custom leather jackets are our expertise at Leather Waves. Look at custom leather jacket on our website. We work online making custom leather jacket, or you can visit our location and order your custom leather jacket in person. Meet the designer, either way,and have a custom leather jacket made to your specifications today!